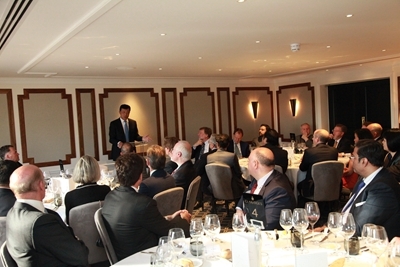 On 12 July, after delivering a key note speech entitled “Hard Times Will Not Stop the Wheel of History” at the dinner co-hosted by Pi Capital and Hampton Group, Ambassador Liu Xiaoming answered questions from the audience on the award of the South China Sea Arbitration initiated by the Philippines. Q: The Arbitral Tribunal rendered this morning the award of the South China Sea case. How does the Chinese Government take the award? Ambassador Liu: After the Arbitral Tribunal announced its ruling, the Chinese Government issued the Statement on China’s Territorial Sovereignty and Maritime Rights and Interests in the South China Sea, and the Chinese Foreign Ministry issued the Statement on the Award of 12 July 2016 of the Arbitral Tribunal in the South China Sea Arbitration Established at the Request of the Republic of the Philippines. Both Statements explicitly expound on China solemn position that China neither accepts nor recognizes the award. The so-called award is null and void. It is illegal and has no binding force. The arbitration case unilaterally initiated by the Philippines and the award rendered by the Tribunal appear to be draped with the cloak of law but they are illegal in essence. Their pretext of protecting the law cannot cover the fact that they are completely against the law. The Tribunal claims to be interpreting and applying the United Nations Convention on the Law of the Sea (UNCLOS) but in practice has breached the fundamental spirit and principles of UNCLOS. It is explicitly stated in UNCLOS that territorial sovereignty is not within the scope of arbitration and the Tribunal has no jurisdiction over sovereignty issues. The submissions made by the Philippines are in essence issues of territorial sovereignty and maritime delimitation. Back in 2006, pursuant to UNCLOS Article 298, the Chinese government made a declaration to exclude certain disputes from compulsory arbitration, such as disputes over maritime delimitation, historic bays or titles, military and law enforcement activities, among others. More than 30 countries, including the UK, France and Russia, have made similar declarations. These declarations are important parts of UNCLOS and should be respected. However, the Tribunal turned a blind eye to them. The Philippines’ unilateral initiation of arbitration infringes upon China’s legitimate rights and interests as a state party to UNCLOS. According to UNCLOS, a state party has the right to choose on its own will the procedures and means for dispute settlement. The Philippines’ unilateral initiation of the arbitration without the consent of China infringes upon China’s lawful rights and undermines the authority and integrity of the international maritime legal system. The ruling of the arbitration runs counter to the agreement between China and the Philippines and violates the consensus among countries in the region. For a long time China has worked relentlessly for the peaceful settlement of the South China Sea disputes with the Philippines. China reached with the Philippines a string of important bilateral agreements on solving the disputes through consultation and negotiations. In the multilateral dimension, China signed with ASEAN countries including the Philippines in 2002 the Declaration on the Conduct of Parties in the South China Sea (DOC), which is a joint commitment to resolving relevant disputes through negotiation and consultation. But the Philippines went back on its own international obligation and commitment by initiating the arbitration. The Tribunal not only defended the Philippines’ breach of agreement, it also denied the legal status of China-Philippines agreement and the DOC, and created excuses for the Philippines’ illegal behaviour. More seriously, the ruling violates the basic norms governing international relations and challenges the purposes and principles of the UN Charter. The Philippines’ unilateral initiation of the so-called arbitration distorted facts and concocted a pack of lies. It was an attempt to deny China’s territorial sovereignty and maritime rights and interests in the South China Sea. The Tribunal paid no respect to solving disputes through diplomatic efforts. Instead, it has set up a bad precedent of vexatious litigation and abuse of power that put the South China Sea issue in a dangerous situation, with growing tension and confrontation. These actions violate the international law and the basic norms of the international relations which are recognized in the UN Charter, namely to respect the sovereignty, independence and territorial integrity of all countries, to resolve disputes peacefully and to safeguard world peace and stability. The arbitration award breaches international law, undermines the basic norms of international relations and endangers regional peace and stability. The Chinese Government will neither accept nor recognize it. China’s position is justifiable, legitimate and reasonable. Q: How does China perceive the consequence of the ruling of the Tribunal? Ambassador Liu: I want to make three points on this question. First, the arbitration award does not and will not affect China’s territorial sovereignty and maritime rights and interests in the South China Sea. The ruling is nothing but a scrap of paper that has no binding force for China. Second, the ruling will not affect China’s resolve to uphold its territorial sovereignty and maritime rights and interests. China will not accept any third-party dispute settlement that does not have China’s prior consent. Nor will we let others impose solutions on us. Third, the ruling will not affect China’s long-standing commitment to peaceful resolution of disputes through negotiations and consultations. China will continue to develop good-neighbourly and friendly relations with its neighbours, safeguard regional peace and stability, and uphold equity and justice of international rule of law. Q: The new Philippine Government has made some new statements on the South China Sea issue. What is China’s take? Ambassador Liu: We have noted the latest statements by the new government of the Philippines, including its readiness to re-open consultation and dialogue with China on the South China Sea issue. There is an old saying in China: “Listen to one’s words and watch one’s actions”. China stands ready to develop relations with the Philippines on a friendly and reciprocal basis and China wants to see its relations with the Philippines back on the track of healthy development at an early date. The door to negotiation is always open and we hope the Philippine side will work with us. Q: What are the actions that China will take in the South China Sea given the ruling of the arbitration? 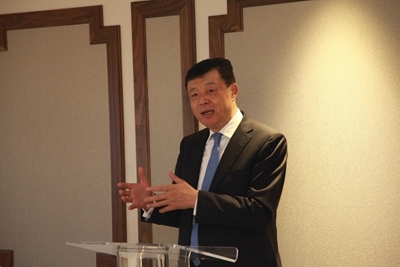 Ambassador Liu: China will remain committed to the “dual track” approach. We will resolve the South China Sea disputes through peaceful means of negotiation and consultation with countries directly involved. This will be based on international law and respect for historical facts. China always stands for “Setting aside disputes and engaging in joint development”. This position remains unchanged and it will not change in the future. At the same time, China will continue to work with ASEAN countries to uphold the freedom of navigation and overflight that all countries are entitled to under international law. We will continue to work with them towards the comprehensive and effective implementation of the DOC, and jointly uphold the peace and stability in the South China Sea.